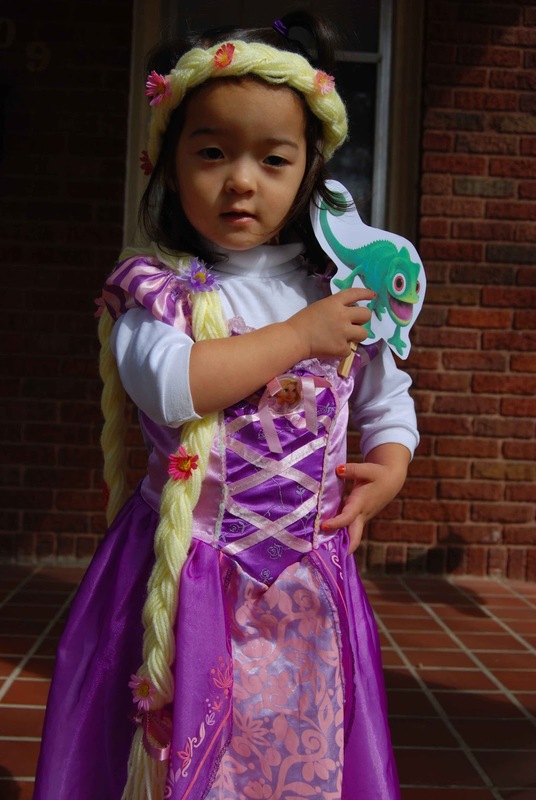 Our little Rapunzel (and Pascal). Katy and Baby Daniel O'Donnell. 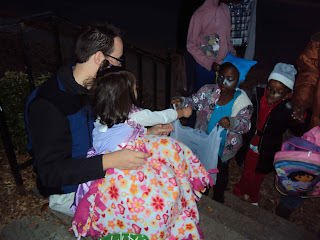 Katy and Daddy, handing out treats! Happy Halloween! Today was a busy day for Lil' Miss! 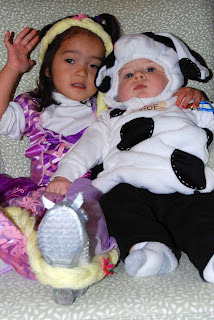 It started out with Pajama Day and Harvest Party at Preschool. Our contribution to the fall-centered party were pumpkin muffins. Of course, in true Fancy Nancy style, they were fancy muffins- complete with frosting and sprinkles ;-P.
Then, after Preschool, some friends came over so that we could do the Downtown Concord Candy Crawl together. We lucked out with some nice- if a bit chilly- weather. 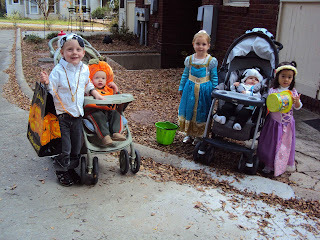 The kids had fun going trick-or-treating at each downtown shop. We saw lots of other MOMs Club friends and friends from preschool. Everybody came back to our house after the Candy Crawl for a nice, hearty chili dinner. The kids played, the adults ate- we had a good time! After our little "party" had dispersed, and Ted got home from work, we sat outside on the steps to hand out candy. 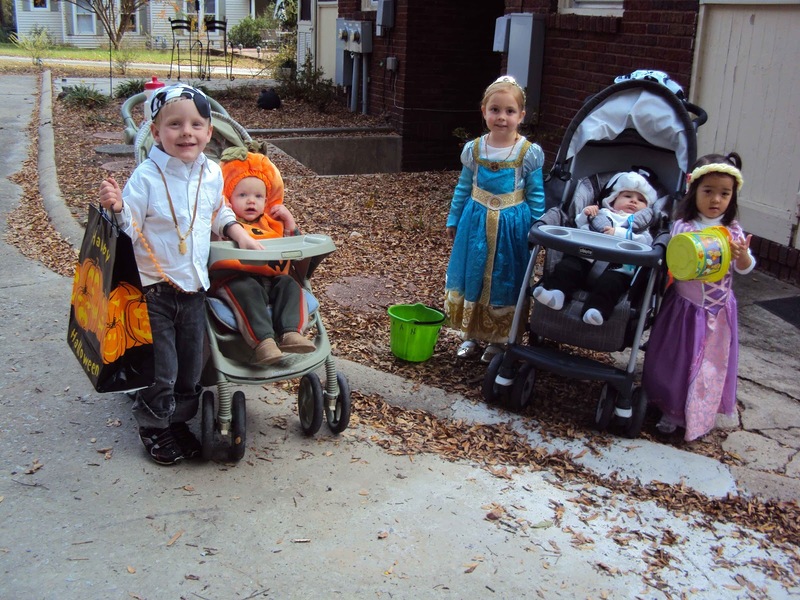 Typically, we have a TON of trick-or-treaters! However, this year, we felt the crowds were a little light. So, while we ended up giving away all 450 pieces of candy/temporary tattoos, some kids lucked out with more than a couple of pieces of loot. Halloween isn't a whole lot of fun for a food-allergic kid. Even though her recent allergy tests came back negative for soy and nuts, we had a hive incident, yesterday. So, I wanted to play it safe and not introduce a whole lot of new/different candy to her diet. Instead, Katy helped us hand out our candy to the trick-or-treaters. She did a great job giving each child some candy and she was so enthralled by all of the activity, costumes and commotion going on! I'd say Lil' Miss had a busy and fun Halloween!